Greg Wheatley, Musical Director of the Glen Ellyn-Wheaton Chorale, shares his thoughts about past and future concerts, musical works we've performed, and the many joys of choral music. Let's face it--most of us use language carelessly. I'm not talking here about coarse language or inappropriate words (though we could discuss that too!). What I have in mind is the fact that we increasingly seem to favor simple words--words we can grasp quickly and easily--over more colorful words that might necessitate our slowing down and pondering their meaning. I think some of this can be attributed to the rise of social media. When a Tweet only allows you 132 characters, you just aren't going to waste them on a word like "dissimulation." Fair enough. But I wonder what we've lost in ruling those more difficult words out of school. Of Christ's birth this jolly day? Whom sin had made but fiend's prey. That hath been ever and shall be ay. And she a lady of great array. Hail, son! Hail, brother! Hail, father dear! Hail, daughter! Hail, sister! Hail, mother mild! That man's pain is turned to play. Now in mankind is new begun. That, in a quatrain, is the Incarnation! The God who made everything has now descended all the way into our humanity and been born in Bethlehem. And the poetry not only describes the event, but clothes it in such wonderful language that it virtually takes our breath away! What a gift language is, especially when it is put into the service of expressing such lofty truth in such beautiful poetry! And then there is the music--in this case, the setting of composer Stephen Paulus. I hope you'll make plans to hear the Glen Ellyn-Wheaton Chorale sing this and many other pieces at Wintersong, our 2013 Christmas concerts (see this website for details). Sitting comfortably on my back porch this afternoon, I’ve just finished listening to Morten Lauridsen’s setting of O Magnum Mysterium. If you don’t know this piece, stop right now, click over to Spotify or your favorite music service, and listen to it. You’ll be in good company—this piece, along with a handful of others from Lauridsen, have become the best-selling choral pieces from the publisher Theodore Presser in its more than 200 year history. In fact, Lauridsen has the distinction of being the most-frequently performed American choral composer. Kind of makes you sit up and take notice, doesn’t it? That animals should see the newborn Lord lying in a manger. To bear Christ the Lord! The musical setting is vintage Lauridsen: lots of close harmony that doesn’t seem to resolve according to traditional rules, but which adds up to create a shimmering tapestry of color that invites us in to its sonic world to contemplate the mysteries it communicates. Challenging to sing? Yes. But in the end, worth it all because of the wonder we singers experience, and the wonder we hope to communicate to those listening. And that’s just one of the chorale’s pieces for Christmas. I could get excited about this—and it’s still August! Choral directors have this in common: they're thinking about Christmas music when the temperatures are soaring! That has been my experience over the last several days, as I've been pondering the chorale's 2013 Christmas program. I've been holed up in the one room in our house that has working air conditioning, and I'm happy to say that I'm ready to talk a little about our concert Wintersong. I think you're really going to enjoy what the chorale has for you this year! There will be familiar things like Hark! The Herald Angels Sing and We Wish You a Merry Christmas. We're also going to treat you to some tasty music you may not be familiar with. That includes All Bells in Paradise, a new piece by John Rutter which he composed just last year for the annual Lessons and Carols from Kings College. Joining the chorale for Christmas this year, in addition to our wonderful pianist Jeri Kellan, will be the wonderful sounds of the harp and the oboe. And of course, the grand contributions of the College Church pipe organ! Add to all this the opportunity for the audience to join in on some carols, and you've got the makings of a great Christmas celebration! Our concerts will be at College Church on December 6 and 7. Save one of those dates, and watch this website for further information. Now if all of this has you interested in singing with the chorale, I have good news! There is still time for you to audition! We are auditioning for all voice parts, and are especially interested in hearing basses and tenors. Auditions will be held August 13 and 20. More information on the main page of this website. Don't be shy! If you've had a bit of singing experience (high school, college, church choirs), you may be just who we're looking for! Aren't you feeling cooler already? Who is Sitting in That Empty Chair? I enjoy Yogi Berra-isms. You know what I mean--pithy quotes that have a bit of quirkiness about them. For example, "Always go to other people's funerals....otherwise they won't come to yours." Or, "A nickel ain't worth a dime anymore." (Looking out over the orchestra) Who is sitting in that empty chair? Wouldn't it have been fun to play in Maestro Ormandy's orchestra? Music is always a community enterprise. The solo performance does not exist. Even its creation is an attempt to communicate, and every performance an effort to unite the minds of men even of different generations. That statement comes from a mission statement of sorts. It was the mission statement of the Collegiate Chorale, founded by the dean of American choral music, Robert Shaw. I think that it communicates volumes about what choral singing should be: a community effort in which the whole is always greater than the sum of its parts. Whether the chorus is singing a januty sea shanty, or a larger work like the Faure Requiem, when you release the last note of the piece, you should feel that you've just been a part of something bigger than yourself--something you simply couldn't have done alone. Now for the commericial (you knew it was coming!) Maybe it's time to ask yourself if you've been missing this kind of musical community. The kind of community that comes from uniting your voice with 50 or 60 others to create (or maybe better to say re-create) a musical experience that you could never have on your own. It's the kind of thing we're about at the Glen Ellyn-Wheaton Chorale. This summer, we're auditioning for all voice parts. Maybe you should consider it! Audition dates are August 13 and 20. More information is on this website. Maybe Eugene Ormandy's question is for you: Who is sitting in that empty chair? Maybe the answer is you! Indeed it has....and then some! The last couple of days have been quite reminiscent of full-blown summer, and if it weren't for the grading I'm doing as a college prof, I just might feel like I was on summer vacation! It's always nice to take a breather, isn't it? 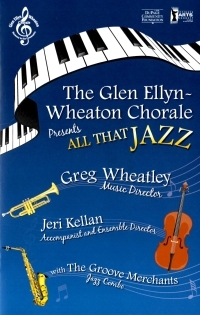 But before I kick back too much, it's time to say thank you to those of you who came to the Glen Ellyn-Wheaton Chorale's concert All That Jazz. We certainly enjoyed ourselves....and weren't The Groove Merchants great! If you missed our concert, let me tell you what you missed: my good friend Howie Whitaker brought together a wonderful jazz quintet who both accompanied the chorale in several pieces, and also played some jazz of their own. I think it made a nice combination for nearly two hours of enjoyable listening. So now it's time for a rest. The chorale returns to action right after Labor Day for what I think will be another great season! And here's where I want to catch your attention if you're a singer. Late this summer (August 13 and 20) we'll be auditioning for all voiceparts. So, if you've been thinking of putting that singing voice to use in a choral setting, please take a look around our website. If you have any questions, I'm happy to try to answer them. You may be just the singer we're looking for! In the words of Irving Mills, "it don't mean a thing if it ain't got that swing." That simple, if exaggerated, sentiment might well sum up what the musical genre of jazz is all about. There's something infectious about hearing Take Five or I Got Rhythm—that indefinable something that makes you want to tap a toe or snap a finger. The type of music that qualifies as jazz is a bit hard to pin down. One observer has said that jazz encompasses elements such as: swing, improvisation, and group interaction. Jazz had its birth in the American south, especially in New Orleans, where the African culture was meeting and coming to terms with European tradition in music. Jazz has roots in the blues, as well as in the work songs and field hollers of plantation workers. Whatever else it is, jazz is most certainly based on improvisation—the art of creating music "on the fly." This is one of the elements that gives jazz its excitement. While the arrangements you'll hear from the Chorale this weekend are technically not improvised (they are written on a page of music), we do think you'll get the sense of vitality that jazz music offers. And if you're looking for authentic improvisation . . . well, that's where The Groove Merchants come in! My good friend and colleague Howie Whitaker has brought together this fine jazz combo just for the occasion. I know you'll love what they bring to this concert! And yes—much of it is created on the fly! We hope you'll join us this weekend—Friday at 8:00 p.m. or Saturday at 3:00 p.m.—at College Church in Wheaton. Tickets will be available at the door—we'll hope to see you there! A Merry Flash Mob Christmas to You! Today I watched another of those increasingly ubiquitous flash mob videos. It seems they're popping up faster than Christmas candy at the office. This one featured a group of young people in a shopping mall, regaling the surprised onlookers with a medley of Christmas carols. As I watched the video, panning first from the singers then to the surprised but happy spectators, I found myself with a bit of a lump in my throat. And let me say that this isn't the first time that has happened to me. It happened when I watched my first choral flash mob a year or two ago. That one was a store performance of the Hallelujah Chorus from Messiah. So what's going on with my emotional response to these events of "planned spontaneity?" Well, at least two things, I think. First, there is the message behind the carols. Of all the good times of the year (as Dickens put it), now...at Christmas....we humans sense that God has come near. It's long been my conviction that, even for those who don't claim much of a religious orientation, Christmas brings an almost intuitive sense that God has done something. The 64-thousand dollar word is incarnation....meaning the invisible God has become very, very visible. So visible, in fact, that he was born in a less than inviting barn in an out-of-the-way little town. That's true identification with humanity. The second reason I think those flash mobs create an emotional response in me springs from the first reason. It's that somehow--for those few minutes that the surprise music lasts--a tired, frazzled, sometimes cynical mass of humanity stops and shares communally in the musical gift that the choir is bringing. The message is Peace on earth, Goodwill to men. And the message is wrapped in the language of the heart--music. Watch the faces of many of the spectators--I think you'll see not just surprise, but what I can only call delight! It's as if time stops for a moment, and they put away their shopping lists, their anxieties, their worries and fears. And for just a moment, they all--singers and listeners--take in the amazing truth that God really has visited this planet. And some dare to believe! So, maybe you'll watch one of those videos between now and Christmas. Or maybe you'll be fortunate enough to be surprised by one on your next shopping trip. You can call the choral flash mob a fad if you like, but as for me, I'm seeing more than what meets the eye! Anybody know where that line comes from? Maybe it's ringing a bell, but you just can't quite place it. Let me help. It's from the English song Here We Come A-wassailing which originated some time in the middle of the 19th century. Back in that day, people would venture door to door, singing Christmas carols and hoping for a bit of kindness from those listening from the threshold. If you're thinking Charles Dickens and A Christmas Carol just about now, you aren't far off. And God bless you and send you a Happy New Year! The tradition of caroling from door to door is one that is at least vaguely familiar to most of us, at least if we're of middle age. But I wonder how often it's done these days. I can't tell you the last time carolers showed up at my door. But last night, a few hearty souls of the Glen Ellyn-Wheaton Chorale took to the streets of Wheaton and raised our voices in familiar Christmas carols. We weren't really looking for handouts (though one generous household did offer some brownie bites!) It was a delightful time! The responses were varied and interesting. In our busy suburban world on a Friday night, it was no surprise that many houses were uninhabited. I caught one homeowner moving across the doorway, but choosing to not open the door. I don't know if he knew that I knew....but I knew! But there were several homes where the response was wonderful! As our little crew of 11 voices (nope! not an even SATB balance) sang out Hark! The Herald Angels Sing and Joy to the World, one couple opened their door revealing two young boys in bath robes and bare feet. Out they came, unshod, onto the chilly concrete porch, and there they stood taking in our Christmas rejoicing. It was tonic for us singers! At another home, a look through a window revealed what was clearly a teenage girl sleepover party underway. Teen age girls? A sleepover? No hope for an audience here. They should be the ones to turn off the light and shut the door, inviting us to go away! But no! The front door swung open, and these young girls seemed to really enjoy what they were hearing! So much for generational stereotypes! At yet another home, a little one of maybe two years old, stood clapping his hands as we sang. It's always a great moment. I'm talking about the moment two or three weeks from a concert when we start to bring all the forces together. It began last night at our rehearsal, and will pick up even more steam next week. At our rehearsal last night, our very capable pianist was joined by another set of hands. This extra set of ten fingers will handle pipe organ duties, and will also combine her talents with those of our regular pianist in a four-hand accompaniment for Deck the Hall. And then there's next week--concert week! The chorale will be joined by an ensemble of string instruments, and the magic of Stephen Paulus' Christmas Tidings will take on a new luster. And the glory of Mozart's Gloria will be even more glorious! Aren't you glad that music making isn't a solo venture? Deck the Hall and a bit of history! Last Friday, I was asked to guest lecture in a class on Baroque and Classical music. Specifically, my charge was to talk about the vocal music of Franz Joseph Haydn. That, of course, meant spending a fair amount of time on pieces like The Creation (an amazing work!). But along the way, you know what happened? It happens to just about any one who is preparing to teach something. I learned a few things myself! And here is one of the fun surprises! Seems that Herr Haydn and some of his students wrote 400 or so pieces based on Welsh and Scottish texts! Imagine that! A man whose native tongue was German (and who, according to reports, wasn't all that great at his English), writing music to Welsh and Scottish texts! Well, here's the fun part: One of those settings is for the Welsh text Nos galans. Now, my guess is that, like me, you had never heard that title before. It's a song about New Year's, written about 1873 by John Ceiriog Hughes. And if you listen to it, you'll immediately hear that it is the tune we know as Deck the Hall. And complete with those fa-la-la's we all love to sing! The words we know enjoy at Christmas were put to this tune around 1881. I don't know about you, but that just makes Deck the Hall a little more interesting to sing this Christmas! Oh and by the way....that's just what the Glen Ellyn-Wheaton Chorale will do in our Christmas concerts Starry Night and Candlelight! And I think you'll like this arrangment by John Miller for choir and four-hand piano. Come check it out! Fa-la-la! An Opportunity to Join Us!